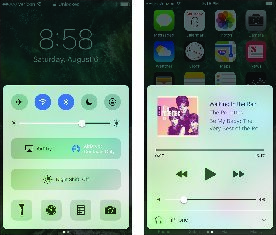 Control Center is a single repository for the controls, apps, and settings on your iPhone that you frequently call upon. You will almost certainly spend a lot more time in Control Center than in Settings. To access Control Center, swipe up from the bottom of the screen — any screen. The beauty of Control Center is that it’s always available when you need it. Now, take a gander and you’ll get an immediate handle on all the things that Control Center lets you get at right away. Control Center pages are merely a swipe away. The Control Center tour starts on the upper row and moves from left to right. You see controls for airplane mode, Wi-Fi, Bluetooth, the Do Not Disturb feature, and the screen’s orientation lock. Now drop down to the next line. Here you can slide a controller to increase or decrease the brightness of the screen. Next up are controls for AirPlay and AirDrop. The latter is a way to share pictures, videos, and other files wirelessly with folks nearby who have recent iOS devices (iOS 7 or later) of their own and Bluetooth turned on. By contrast, AirPlay is a way to stream music and movies wirelessly via Wi-Fi to Apple TVs and to compatible AirPlay-enabled speakers and receivers. Moving on, there is a new called Night Shift, which automatically adjusts the color spectrum of your display after dark, with the goal of reducing eyestrain and helping you get a good night’s sleep. Inside iPhone Settings, you can schedule when Night Shift kicks in and make other adjustments. But here in Control Center, you can turn on or off Night Shift manually. At the bottom of Control Center, you find one-touch icons that lead to the iPhone’s built-in flashlight, timer (part of the Clock app), calculator, and camera. Apple assumes that you’ll use these apps and utilities frequently, which in our case is absolutely true. If you turn on the flashlight via Control Center on iPhones with 3D Touch, you can apply pressure on the flashlight icon to bring up a menu that lets you then switch the intensity, from bright to medium to low. Meantime, if you’re familiar with how Control Center used to look, you’ll notice that something appears to be is missing: the play controls for audio. These controls now get their own separate page or card in Control Center, which you can access by swiping from right to left when the first page of controls is visible. Now you can see the artist and the title of the song that you’re playing. Slide the volume slider to make that tune louder or softer. A third page of controls is available if you have lights, locks, thermostats, and other household accessories connected to the phone’s Home app, a new feature with iOS 10.